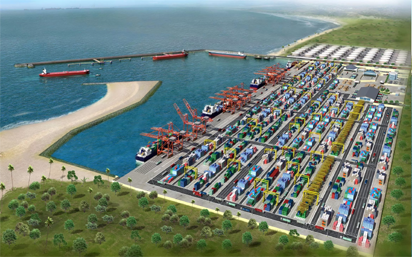 UYO—Crisis is brewing in Akwa Ibom State following the alleged relocation of the multi-billion dollars Ibom Deep Seaport from Ibaka in Mbo to Ibeno in Ibeno Local Government Area of the state. Youths drawn from the five local government areas, namely Oron, Mbo, Urue-Offong/Oruko, Okobo and Udung Uko are spoiling for war with the state government over the project, which they claimed had been taken away from Oroland. To this end, the youths, under the aegis of Nlap Isong Akpakip Oro, have begun the mobilisation of their members in the state and beyond with a view to staging a protest to draw attention to what they described as the alleged marginalisation of Oro nation in the scheme of things by successive administration in the state. Spokesman and National President, Godwin Ettah, told Vanguard in Uyo that the youths would resist any attempt by Governor Udom Emmanuel’s administration to strip Oro area of the project and its attendant socio-economic benefits, despite that fact that the area accounts for 70 per cent of oil production quantum the state was contributing to the national purse. He said: “We are totally against what the state government is doing concerning the Ibom deep seaport or Ibaka deep seaport. Our concern is that the first place to site that project is in Ibaka. It is in Oro. The feasibility study and everything that was done by the government pointed to that fact.